Pioneer VSX-919AH review | What Hi-Fi? It's very easy to be seduced by this Pioneer's glossy black fascia, punchy display and smattering of bright neon blue and red lights. But the '919AH needs to do more than just flutter its eyelids to secure a good star rating. Thankfully, Pioneer has always packed its amplifiers with useful technology and the '919AH exhibits some features that have trickled down from its more expensive models. These include the colourful, easy-to-follow user interface, which gives you access to all aspects of your system set-up, including such joys as graphs for reverb and standing waves. These are produced as part of the amp's Multichannel Acoustic Calibration (MCACC) system. 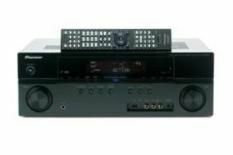 The '919AH is also Pioneer's first amp at this price-point to feature PQLS (Precision Quartz Locking System), a technology designed to work in conjunction with a compatible Pioneer Blu-ray player to reduce the effects of jitter while listening to two-channel content over HDMI. While other manufacturers charge you tens of pounds for a dedicated iPod dock, the '919AH comes with its own connector, complete with composite video output. The amp even shows your album artwork on-screen. It's a great feature. The '919AH fires out a potent, attention-grabbing sound. Bass is taut and punchy, and the Pioneer spits out sound effects with breathtaking accuracy. During House Of Flying Daggers, the bamboo sticks are hurled through the air and hit the ground around the feet of our heroes with fantastic precision. Dialogue is open and forthcoming. When it comes to the more brash moments of the film, such as the choreographed sword-fighting sequences, the amp's treble does stick out ever so slightly. And, when faced with music, the amp doesn't deliver with quite the same insight and refinement as the real class-leaders. This has the look of an affordable AV goddess and sounds good to boot, just not quite good enough for five stars.